Prana World Consulting offers high-quality, professional advisory and program development services to early-stage, developmental companies and established companies throughout the world. These services focus on personal development and education, renewable energy, environmental remediation and technologies, waste treatment and management, and sustainable agriculture and development. We have experience in the design, development, delivery and management of programs in a variety of industrial, commercial and educational settings, and have conducted consulting and training work for companies and individuals in Australia, China, Vanuatu and the Pacific, India, the Ukraine and United Arab Emirates. To contact one of our consultants, please email us at: consulting@pranaworldgroup.com. Dr Lee Fergusson (above) of Prana World Consulting providing advisory services to the senior management of Maharishi Solar Technology Private Limited's photovoltaic wafer, cell and module manufacturing site in Andhra Pradesh, India. 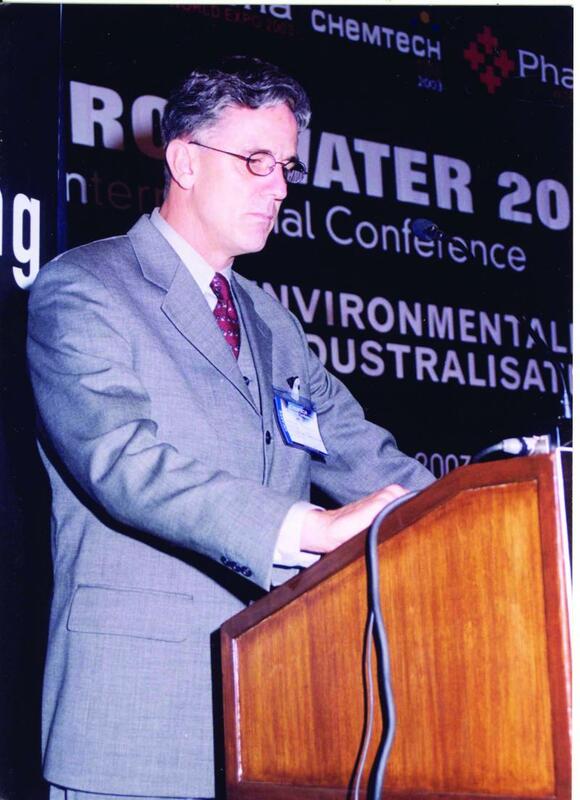 Dr Lee Fergusson (below) speaking on state-of-the-art environmental remediation and sustainable technologies for municipal and industrial wastewater and solids treatment at the EnviroWater Session of the global ChemTech environmental conference in Mumbai, India.